Traditional Butchers Red and White Stripe Mens Cotton Apron Gift that you can have made completely unique with a personalised name or message. Traditional Butchers Red and White Stripe Mens Cotton Apron Gift that you can have made completely unique with a personalised name or message. A great cookery Gift for Dads, Grandfathers, Brothers, Uncles or anyone you want to give a special gift to! 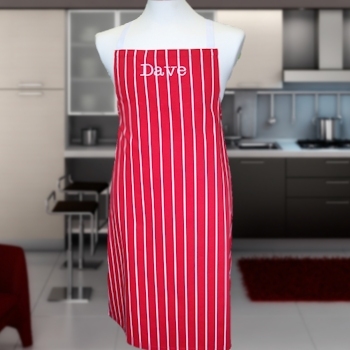 This apron is made from durable 100 percent cotton and is fully machine washable at 40 degrees C.
Traditional Butchers Red and White Stripe Mens Cotton Apron Gift that you can have made completely unique with a personalised name or message. A great cookery Gift for Dads, Grandfathers, Brothers, Uncles or anyone you want to give a special gift to! This apron is made from durable 100 percent cotton and is fully machine washable at 40 degrees C. Adjustable neck strap and waist ties so fits most all adults. Apron size approx 84 x 74 cm If you would like this personalised tick 'yes' and please fill in your own short personalised message or name you would like Amys Gifts to embroider onto the front of the apron. For personalised items we try to get your order shipped out within 3 days as these are handmade to order.